As the name implies, Download Booster feature of Samsung Galaxy TabPRO lets you download large files faster by using your Wi-Fi network and mobile network data connection at the same time. You may incur additional charges depending on your payment plan for using Download Booster on your TabPRO device. 1. Tap to select Settings from the Home screen to begin with. 4. Drag the activation switch to the right. You should then see the Download booster icon showing on the notification panel when you are using the feature on your device. 5. 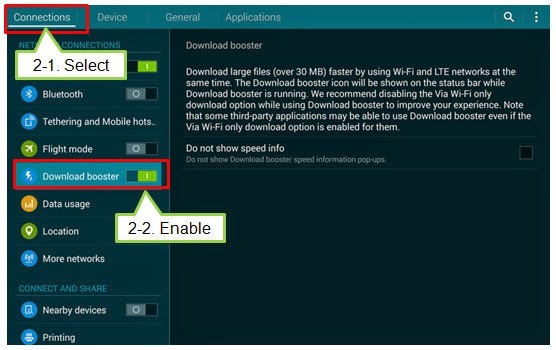 You may choose to display notification pop-ups for Download booster speed. Just tap to check or un-check the box next to Do Not show speed info under Download booster menu. Now test download speed on your Galaxy tablet and see the difference.